The distinguished Rabbi of Yanov was well known for his piety and high level of Torah scholarship. On the occasion of the wedding of his son to a bride in a faraway town, he invited the dignitaries of his town to travel with him to the wedding. A caravan of carriages, carrying Yanov's most prominent citizens, set out in honor of their Rabbi and to share in his joy. The Rabbi rode in the lead coach, accompanied by the bridegroom, the lay leader of the community, and a certain gifted young scholar. When the time came to recite the afternoon prayers, they all climbed down from the carriage to find a quiet spot in the forest in which to pray, the Rabbi choosing to stand under a tall tree at a little distance from the others. The other three waited respectfully in the carriage for his return, but even when the sun had set there was no sign of him. They set out to look for him among the trees, expecting that he had tarried over his prayers, but they could not find him. As night fell they became increasingly anxious. Returning to the highway they found that the rest of the caravan had caught up with them. The others reassured them: "A short while ago one of the worthies of our town drove past us alone in his coach on his way to the wedding. The Rabbi must have joined him for some reason." This assumption sounded plausible enough, so they set off again to the town of the bride, feeling much relieved. On their arrival at their destination, however, they were stricken with consternation: the father of the bridegroom was not there. Guesses of all kind were proposed, but finally, the wedding ceremony had to take place without the missing father. It was solemnized in the most dismal spirit imaginable. All the way home the guests asked passersby whether they had seen the Rabbi, but in vain. Nor did they find him at home at Yanov, nor did the messengers sent out to various other places bring back any clue. Actually, the Rabbi had lost his way in the forest. Wanting to return to the highway, he had become confused by the roundabout tracks leading in all directions, and in fact walked on in the dark for several miles deeper and deeper into the wilds. As the sun rose he paused to rest, and was obliged to recite his morning prayers with neither tallit nor tefillin. On he wandered for weeks on end, surviving on whatever fruit he could find. So distressed was he by his tribulations that he lost track of time, and honored Shabbat in whatever humble ways his predicament allowed one day early. The virtue of his Torah study over the years stood him by. The Al-mighty protected him from harm, until at long last, after all manner of adventures, he found his way back to Yanov, and recounted his unenviable story to a family wild with joy. Came Thursday afternoon, and the Rabbi busied himself with all the traditional preparations for the approaching Shabbat. When he expressed his puzzlement that his family did not do likewise, they explained that his calculations had become confused: Friday was only the next day. But the Rabbi since his youth had always been an exceptionally stubborn person who never ceded an argument, and now, in addition, all the suffering he had undergone must have left its somber mark on him. No matter how earnestly his relatives and townsmen debated and argued the subject with him, nothing could make him budge from his irrational fixation: he alone was correct in his calculations. They became secretly worried about his sanity, but what could be done? On Friday he desisted from travel, and did not put on tefillin at morning prayers, as if the holy day had already arrived. But the next day, the bizarre aberration took on tragic proportions, as the Rabbi treated Shabbat like a weekday, doing all sorts of forbidden labors. He also reprimanded his family for their stubbornness while their buoyant joy at his return was overlaid with dismay. In the weeks that followed, rabbis and sages from all around tried to convince him, with the aid of entire batteries of invincible scholarly arguments, that this time he was in the wrong. To no avail. Though rational in all other respects, his harsh experiences in the forest had further toughened his innate obstinacy. Some of the townspeople decided to convey word of the bizarre situation to the famed Chassidic Rebbe, Rabbi Shmelke of Nikolsburg, who was a close friend of the Rabbi of Yanov since their youthful yeshiva years together. Reb Shmelke, who was then the Rabbi of Shiniva, immediately set out for Yanov, arriving on Thursday. Overjoyed at seeing his boyhood friend, the Rabbi of Yanov asked his guest: "Would you do me the honor of staying with me for Shabbat?" "Why, of course," said Reb Shmelke. "In fact I was hoping for such an invitation." "Then you do realize that tonight is Shabbat?" said the Rabbi in wonder and delight. "What is the question?" replied Reb Shmelke simply. "Thank G-d!" sighed the Rabbi, exuding relief. "You don't know what a difficult time I've been having with the stubborn people here. Ever since I came back they have been laboring under the delusion that Shabbat is a day later, and I can't seem to convince them." "Perhaps I can help," Reb Shmelke smiled. "Trust me." On Thursday afternoon the two men set off to immerse themselves in the mikveh. The local folk were stupefied: surely their Rabbi had not won over Reb Shmelke! At first opportunity he privately reassured them, and then asked that everyone come to shul that night in their Shabbat finery. He also took aside his host's family and told them to prepare for Shabbat that same evening, and to bring to the table a few bottles of old strong wine. As the beaming sun dipped behind the trees, all the menfolk duly dressed up in their fur shtreimels and black silk kapotes, and proceeded to the synagogue for evening prayers. The Rabbi was amazed at what Reb Shmelke had managed to accomplish in such a short time. "Could it be that there is something to this Chassidic rebbe stuff after all?" he mused to himself. The guest turned down the invitation to serve as chazzan, and insisted that the host lead the prayers of welcome to Shabbat, saying that would be one of the pleasures of his visit. The Rabbi began with a pleasant tune, while Reb Shmelke and all the other congregants quietly recited the weekday evening service. As if it were Friday night, the Rabbi and his family returned joyfully home, where they were joined by a great many guests who had come in honor of Reb Shmelke. They sang Shalom Aleichem, welcoming the ministering angels whose appointed time is Friday night; they recited the Kiddush of Friday night over goblets of wine; and in between the courses of gefilte fish and other delicacies not normally reserved for Thursday nights, they exchanged favorite gems of Talmudic lore, as Jews all around the world are wont to do on Friday night. In the course of the festive meal Reb Shmelke remarked to his host that it would be only right to turn this occasion into a Thanksgiving Meal for his miraculous survival -- by serving a few extra bottles of wine, for example. He then saw to it that his host drank a considerable quantity of the kind of old wine that throws a person into the extended stupor of deep sleep. When the Rabbi duly fell asleep at the table, Reb Shmelke asked that the curtains be drawn and a pillow placed under his head so that he should be able to slumber on, undisturbed. Finally, taking up his pipe and puffing happily away, he turned to the townsfolk who were at the table: "You can now all go off and rest. Everyone can go ahead with his usual occupations, and with the help of the Almighty, everything will work out well. And tomorrow night, on Shabbat eve, at this same hour, I would ask you all to come here again after your meal." Reb Shmelke personally stood on guard all that night and throughout Friday, enforcing silence around the house as well as within it, lest the slightest noise disturb the Rabbi in his sleep. On Friday night he did not even go to the synagogue, but prayed alone in the house of the Rabbi. After their meal, the townsfolk filtered in and found the Rabbi still sound asleep. They assumed the same positions around the Shabbat table as they had done the night before. Reb Shmelke partook of the Shabbat meal joyfully, delighting his listeners with discourse after discourse until midnight. Then woke up his host. "Rabbi of Yanov," he said, "please join us for the Grace after Meals." After Shabbat all the local dignitaries came to offer Reb Shmelke their whispered thanks, to which he responded by making them give their solemn promise never to make the slightest mention of the whole episode. And until the day of his death the Rabbi never discovered what had happened. On the contrary, he was proud of the fact that so many people had finally seen the light and were now observing Shabbat according to the way he had argued all along. "Mind you," he would add, "one must give credit where credit is due. It took none less than my esteemed friend from way back, to do the trick. Funny, isn't it? Some people can be so obstinate!" Biographical note: Rabbi Shmuel Shmelke HaLevi Horowitz of Nikolsburg (1726-1778) was a major disciple of the second leader of the Chassidic movement, Rabbi DovBer, the Maggid of Mezritch, along with his younger brother, Rabbi Pinchas, who became the Rabbi of Frankfort. Many of the leading Chassidic rebbes in Poland and Galitzia were originally his disciples. Among the books he authored are Divrei Shmuel and Nazir HaShem. Shalom Aleichem and Eishet Chayil had already been sung. The candle flames reflected a yellow sun in the ruby wine of the decanter. A hush settled over the room as all edged closer to the Shabbat table to hear Father recite the Kiddush. Father took a deep breath and... fell asleep in his seat! "Tatteh! Tatteh! Father! Father!" the family called. No response. Mother put her hand on his shoulder and shook him, but that didn't help either. "Wake up! Wake up!" the children screamed frantically. Deciding he had fainted, the adults also began to worry and someone ran to get the doctor. He came, but he too found it impossible to either arouse him from his deep slumber or to understand what had happened to him. He suggested to let him sleep it off. Someone else would have to make Kiddush. The head of the family, a miller by trade, didn't wake up till morning. He was astounded and embarrassed to hear what had happened. But the next Friday night it happened again. And again. And..
"Oh, no! Not again!" cried out the miller in frustration. He rose from his chair where he had fallen asleep over the Shabbat table and stretched his stiff limbs. "What is happening? Nothing helps! I can't go on like this. Tomorrow I'm going to the Rebbe!" The next day he went to Zichlin, to his Rebbe, Rabbi Shmuel Abba, and told him the whole story. Bursting into tears, he begged to be cured from this bizarre affliction. "It seems," said the Rebbe, "that you have somehow violated the Shabbat, which is why you are being prevented from honoring her." The Chassid became even more upset. "I don't understand. I'm so careful with the laws of Shabbat. Violating the Shabbat? I can't imagine how that ever might have happened." Broken-hearted the Jew returned home. When he told his family all the Rebbe had said, they were astonished. Everyone knew how careful he was about keeping Shabbat. But then, one of his older sons spoke up. "Father, I have to tell you that the Rebbe's words revealed genuine divine inspiration because, unfortunately, they are true. One Friday night, when I was up late, I saw you get up in the middle of the night. You were obviously still half asleep. I saw you light a candle so you could see your way to get a drink of water, and then you extinguished it when you were finished. The next morning it was clear that you had no recollection of what had happened, and not wanting to shame you or show disrespect, I never said anything. But now that the Rebbe himself has referred to it, I realize I am obligated to divulge what I saw." The man immediately set forth for Zichlin again. He told the Rebbe what his son had reported and the Rebbe said, "That's it. How can a Jew allow himself to forget the holiness of Shabbat, under any circumstances? There are two primary obligations toward the Shabbat to 'remember' it (Exodus 20:8) and to 'safeguard' it (Deuteronomy 5:12) both of which, our Sages tell us, were declared by the Almighty in a 'single utterance.' 'Remember' is accomplished through speech, by expressing the holiness of Shabbat in words of the Kiddush. 'Safeguard' is for the mind and heart, to be continually aware of Shabbat's holiness throughout the entire day, that it not be transgressed. But you failed to 'safeguard' the Shabbat, so you have forfeited the right to 'remember' her." "Please Rebbe," sobbed the man, "tell me how to repent. Give me a remedy. Save me from this unbearable affliction!" "There is nothing I can do for you. The only 'remedy' there is for you is if you are challenged by a test in Shabbat observance, and you stand up to it. Then the Shabbat will be appeased of your insult." These final words made the Chassid feel a little better. He trusted the Rebbe, and resolved to stand up to the trial no matter what it may be. Shortly thereafter a summons came from his poritz, the nobleman from whom he leased his mill in exchange for an annual rent and a percentage of its income. The latter informed him that he planned to greatly expand the flour mill's capacity, and that in order to recoup the large amount of money that he would have to invest, it would be necessary for the mill to operate on Saturdays as well, starting now. "That's impossible," the Jew declared firmly. "I only work six days, never on Shabbat." "Oh, come on," said the nobleman, "I know you Jews. You can get around it if you want to. I heard that a rabbi can make some kind of contract where you can stay home, but the mill stays open and I don't lose the income." "I've never employed such a leniency in relation to Shabbat, and I never will," the miller firmly declared. The nobleman raised his voice. "Stubborn fool! I'll give you the two months it will take to complete the renovations to start to operate the mill on Saturday. If you don't, I'll throw you out." The poritz carried out his threat, and evicted the miller. Bereft of his income, he and his family soon fell into hard times. Even basic food for the children became hard to supply. What's more, his "Shabbat disease" still afflicted him. But the Chassid persisted in his determination not to fail the Shabbat again. Meanwhile, the mill's owner had completed the expansion of the mill, and had found a manager who was willing to work a seven-day week. But right from the start it didn't work out. Unusual accidents kept occurring, and all sorts of problems arose. Huge losses piled up. The situation was bizarre and everyone realized it. The nobleman was forced to admit to himself that his problems must be connected to his having ruined the livelihood of the Jewish miller. So he sent for his former tenant and, after revealing the mill's desperate situation, offered to lease it to him as before. "And what about my Shabbat?" the Chassid asked. "Look," he answered, "after all the unusual problems and sharp losses, I realize that G-d is with you. Do however you see fit." So the Jew returned to the mill, and was soon blessed with more success than he had ever had. Also, his affliction disappeared at the same time, just as the Rebbe had said. But even with his new wealth, reciting Kiddush on Shabbat night remained his greatest pleasure. Rabbi Shmuel Abba Zikelinsky(1809-1879) was a disciple of the well-known Chassidic master, Rabbi Simcha Bunim of Pshischah, and subsequently a Rebbe in his own right with a large following. “Wow! This is exactly the opportunity I’ve been waiting for!” said Reb Naftali of Rofshitz, one of the leading disciples of the Seer of Lublin. 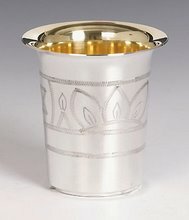 When they came in, the Seer was busy polishing his unique kiddush cup, as he did every Friday before Shabbat. 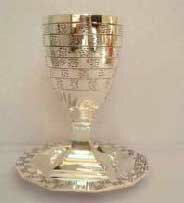 This was an extraordinary chalice, exquisitely crafted of pure gold, with intricate engravings depicting famous sites in the Holy Land, such as the Western Wall, the Tower of David, and the Mount of Olives. Many rumors surrounded this kiddush cup and its history. It was said that the Seer had inherited it from one of the great chasidic masters of the previous generation, and whoever was privileged to make a blessing over its contents and drink from it benefited infinitely. Not that this merit was easy to come by. The Seer did not allow anyone else to use it or even touch it. The whole week it stood in a locked cabinet until Friday, when he would work on it until it glistened and sparkled on the white Shabbat tablecloth. The chasidim hurriedly attempted to soothe him, anxiously muttering words of appeasement. Finally he calmed down. Then he smirked. "I tell you what," he offered. I'll sell you my onions if, and only if, you fill this goblet with whisky for me to drink." He pointed at the Rebbe's golden cup shining on the table. The chasidim drew back, aghast. From this holy kiddush cup which no one dared touch except the tzadik, this uncircumcised drunken peasant should imbibe his crude booze? They offered him other cups and glasses, bigger ones, singly and in combination, but he was stubborn. "Only from this one, like I told you. Otherwise I go home." Rabbi Naftali of Ropshitz (6 Sivan 1760 [the same day as the Besht's passing!] -11 Iyar 1827) became the rebbe of many thousands of chassidim. He was noted for his sharp wit and humor and his elusive shining aphorisms. Some of his teachings are collected in his works, Zera Kodesh, Ayalah Sheluchah, and Imrei Shefer. Many stories about him appear in the book, Ohel Naftoli. The chasidim of Poland were reeling from the shock. Their rebbe, Rabbi Moshe of Lelov, had decided to make aliya, to ascend and settle in the Holy Land! How could they possibly go on without his holy leadership? To his most intimate chasidim he revealed that since early childhood, he had had an overwhelming desire to do something special to hasten the coming of Moshiach. When he was a small boy, Rabbi Moshe's father, Rabbi David of Lelov, had told him, "I did not merit to see the Holy Land, but you must go there. Through your divine service which you will perform there, you will succeed in bringing Moshiach sooner and hastening the Redemption." This was the true reason, known only to a select few, that the tzadik was preparing for his journey to the Holy Land. He passed through many towns and villages on his way, accompanied by his chasidim. At the town of Sadigur, he stopped to say his farewell to the tzadik, Rabbi Israel of Rizhin. When the Rizhiner Rebbe heard of the Reb Moshe's plans to journey to the Holy Land, he begged him to wait and allow him to go along. But Rabbi Moshe was impatient to continue his journey. "My white beard is unwilling to allow any postponement," he replied; and so he continued his journey alone. From time to time, when the retinue stopped, Rabbi Moshe delivered chasidic discourses. He expressed his intentions to the chasidim, telling them that upon arriving in Jerusalem he would, "First go to the Kotel [the Western Wall] and blow the shofar so that all the worlds [this world and the innumerable spiritual worlds] will shake. I will refuse to move from that spot until the Moshiach comes. "I am also bringing with me the kiddush cup which belonged to my teacher and rebbe, the "Seer" of Lublin. This cup is filled with great holiness*** which will enable me to work many wonders." The tzadik continued his journey until he reached the point of departure. Then, he bid a final farewell to his disciples and, together with his family boarded a vessel bound for the Holy Land. After a long voyage, they landed on the longed-for shores of the Holy Land. They headed at once for Jerusalem and reached the gates of the Holy City. No sooner did they approach the city gates when the precious goblet which had belonged to the Seer slipped from Rabbi Moshe's sack and shattered on the stones. They tried to continue their journey, but Rabbi Moshe was suddenly overcome with a terrible illness. They had no choice but to break their trip until he recovered. But the tzadik only became sicker and sicker, until he became critically ill. In a few short days, Rabbi Moshe felt that he would not live much longer. He entreated his family to quickly carry him to the Kotel, and this they did, fearing that his end was, indeed, approaching. But as they hurriedly carried the tzadik toward the Kotel and were about to reach the final turn, they were attacked by Arabs hurling stones down from the surrounding houses, and were lucky to escape with their lives. Rabbi Moshe of Lelov passed from this world 72 days after his arrival in the Holy Land, without having realized his fondest dream and without having succeeded in bringing the Redemption, for it was ordained by Heaven that the time for Moshiach's arrival had not yet come. *** Editor's note: For more on the kiddush cup of the Seer, see Story #123. Biographical note: Rabbi Moshe of Lelov [? - 13 Tevet 1851] was the son of R. David of Lelov and the son-in-law of "the Holy Yid " of Pshischah. He declined to officially succeed his father as rebbe, considering himself unworthy of the position. He moved to Israel, where he helped to strengthen the Chassidic community, although he passed away. He is buried on the Mount of Olives, near the prophet Zacharia. OK how do I make Kiddush? May G-d help us to cherish our Jewish background and make Kiddush! What are your thoughts please share them with us! 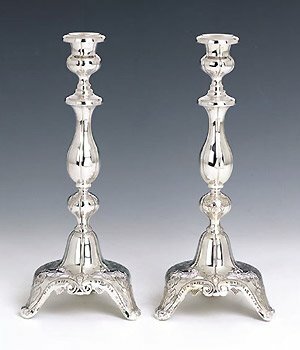 Shalom welcome to my latest blog about kiddush. Kiddush is probably one of the most famous mitzvos - commandments that Jews from all walks of life have heard of and perform. Its a simple easy and pleasurable mitzvo. Just take a cup of kosher wine on Shabbos / Shabbat or the Sabbath (or however you pronounce it!) and recite the kiddush! Say the blessing Borei Pri HaGafen and walla! Instant sanctification and holiness! This blog will hopefully share with you customs of kiddush, how to pronounce and say kiddush, kiddush stories and more! So please join us!